Tired of playing basketball with the trashcan in your office? 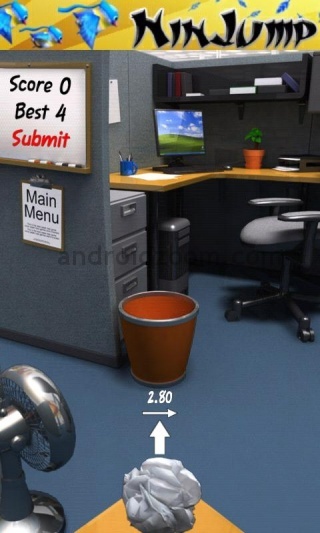 If you aren’t, you can take this fun game online on your Android device with Paper Toss. 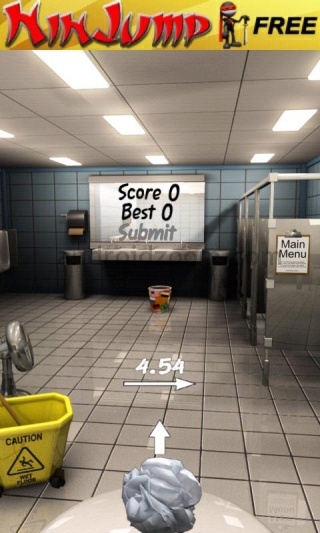 What makes Paper Toss challenging is not being able to throw the paper ball in the trash can. The true challenge is flicking your screen hard or soft enough for the paper ball to make it into the trash can as you start going through the easy levels and then go into the really hard ones. Apart from that, you also have the challenge of getting the paper ball into the trashcan with fans and other cool challenges that you can take advantage of. The game has three difficulty options: easy, medium and hard. It also has different settings in which you can play in: like an office, an airport, a basement or even a restroom. Every level is a challenge and the game includes six levels with different difficulties. The difference between difficulties is the distance between your hand and the trashcan, so the harder the difficulty, the farther you have to shoot. Paper Toss has been installed over 35 million times and it is a favorite, so make sure to download this game as well as others from the same developers. Don’t pay for other similar games, they all have the same exact rating as paper toss and you get this game for free. Your high scores are registered on a worldwide leader board, which allow you to compete with your friends as well as other people around the world. You can be sure that this game will have you hooked once you start. Download Link : Download Paper Toss.